Today’s “a day in the life” is Gina of Running to the Kitchen. I haven’t had the chance to meet Gina in person but I’ve known her for awhile through our food blogs. She comes up with the most creative food and her photography is gorgeous. Make sure to not only read this feature on her but also take some time to dive into her site. She’s traveling in Europe right now so make sure to check out her social media for glimpses of her adventure as well! I was born and raised in NY about 1 hour north of NYC, briefly moved to Florida for 2 years after getting married and have regretted my stupid 25 year old decision to move back to NY ever since. Seriously, who can make sound life choices at that age? Give me the sunshine and warmth! I’ve been married for almost 8 years, don’t have or want kids (my weimaraner, Ginger, gives me enough adult responsibility for now) and I now do this blogging + freelance thing full time. I started Running to the Kitchen about 3.5 years ago as an outlet. 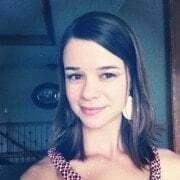 I’ve always loved food (all of it) and went through a quarter life crisis where I applied and enrolled in culinary school when my full time business job I’d had for 4 years wasn’t really doing it for me anymore but then freaked out about having a husband, mortgage, dog and bills to pay a week before classes started and withdrew. I spent the next 2 years wallowing about not really loving what I was doing and trying to find a way to incorporate food into my life without having to go back to school to do so. So, I started a blog. I alternated between posting really horrible pictures of delicious recipes and ramblings about running (I used to be obsessed, now I prefer lifting heavy things at CrossFit) for the first 6 months or so before deciding to really turn it into a healthy focused recipe site which it’s been since. Last fall, after wanting to leave my job for over a year the decision was made for me when my position with the company I’d been with for almost 10 years was eliminated. No heads up, no warning, just administrative changes and boom…no more job. There’s still some residual anger about the whole thing but honestly, it was the best and most amazing thing that’s happened to me. I now blog and freelance write full time. I’m my own boss, I can take as much vacation as I want without approval, work in my pajamas until lunch if I want to and I no longer have that Sunday night dread as the workweek approaches. Anywhere from 7:30-8:30: Wake up. No alarm clock unless you count a whining weimaraner when she needs to pee. 9:00: Breakfast! Favorite time of the day, mostly because there is nothing better than coffee + my couch + computer. 9:30: After eating I’ll usually spend the next 2-3 hours on the couch with the aforementioned coffee doing anything from submitting posts to food sites, freelance work, editing photos, reading, pinning and commenting on other blogs, etc. 11:00 This is usually when I decide it’s a good time to put a bra on for the day and get dressed. Meaning, I put workout clothes on. Outside of Stitch Fix, I probably haven’t shopped for “real” clothes in about 2 years. 11:15 Start cooking whatever recipes are on tap for the day, photograph and eat them (hello, lunch). Sometimes this is 1 recipe, other times 2-3 depending on what needs to get done. 3:00 CrossFit! Second most favorite part of the day (after coffee). I’ll typically spend 1-2 hours making myself so sore that getting out of bed the next day is miserable but for some reason I love it and come keep going back for more. 5:00 Edit pictures from shooting earlier, set up posts for the next day or so and/or grocery shop (<– an almost daily occurrence that happens at all different times of the day). 7:00 Dinner. Usually. This one is so variable. Sometimes I’m ravenous after CrossFit and will just eat early. Other times, I’m waiting for my husband to get home from work (which won’t be until about 8pm) and don’t eat until much later. 8:00 Finish any loose ends for next day’s post. A lot of times I’ll set up pictures and recipe in a post but not actually write it until the night before just so whatever I’m saying is actually relevant in real time. 9:00 One (or more) of many Netflix or Amazon Prime shows we’re addicted to with plenty of interruptions to check Instagram and Facebook in between. 11:30 Bed. Where really, I’ll just play on my phone until after midnight even though I should be sleeping. Since saying my chef knife would be lame. I mean, obviously a knife is a must-have! I’m gonna go with a fun one, my Oxo julienne peeler. This $10 gadget makes perfect veggie noodles and takes up about 1/10 of the space a fancy spiralizer does. Love that thing. Our family room. To make a long story short, we almost moved last fall, sold about half of all our furniture and then everything fell through. Which basically meant, yay for new furniture!! 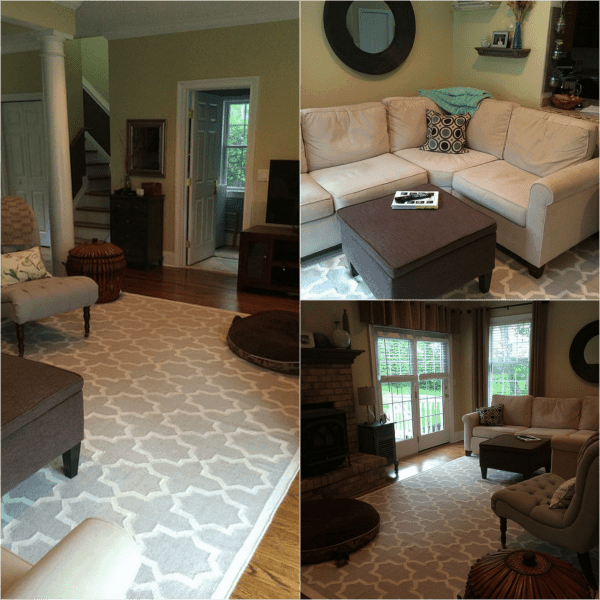 After spending far too much time (and money) in HomeGoods, Joss & Main and Pottery Barn, our family room looks nothing like it did a year ago and finally exactly how I wanted it to in my head. I could spend all day comfortably laying on our new sectional with the wood stove and Ginger nearby on her dog bed. It’s the exact kind of cozy, casual comfort I was going for. Parma, Italy. I’ve been to Italy 5 times and visited Parma for the first time in 2012. It’s the perfect balance of everything I love about Italy, old charm, just big enough of a city to explore, ridiculously delicious Tuscan food, quaint gelato and coffee shops and really good wine. 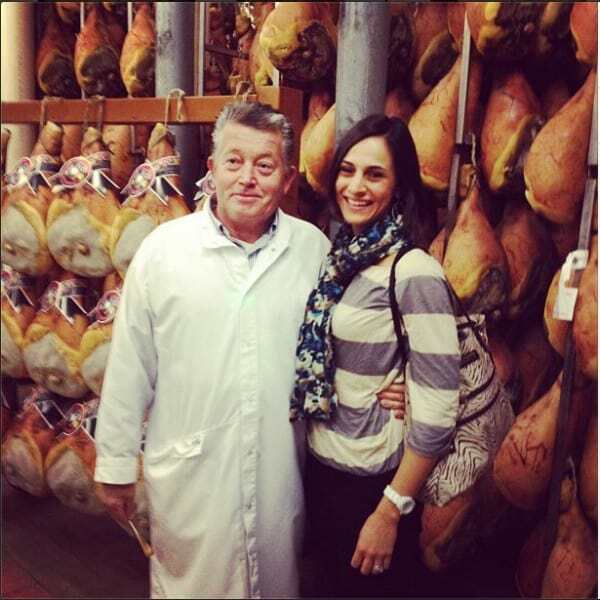 Plus, old men that like to flirt with young women and feed them prosciutto. I can get down with that. There are a few but these Blood Orange Cream Cheese Filled Chocolate Glazed Donuts I did for Doughnut Week are definitely up there. They’re baked not fried and yet the taste is pretty much SPOT ON yeasty deliciousness. The dough came out beautifully (you know those times where you can just feel the perfection in a dough? Yeah, that.) and they rose and baked to the perfect donut-ness. 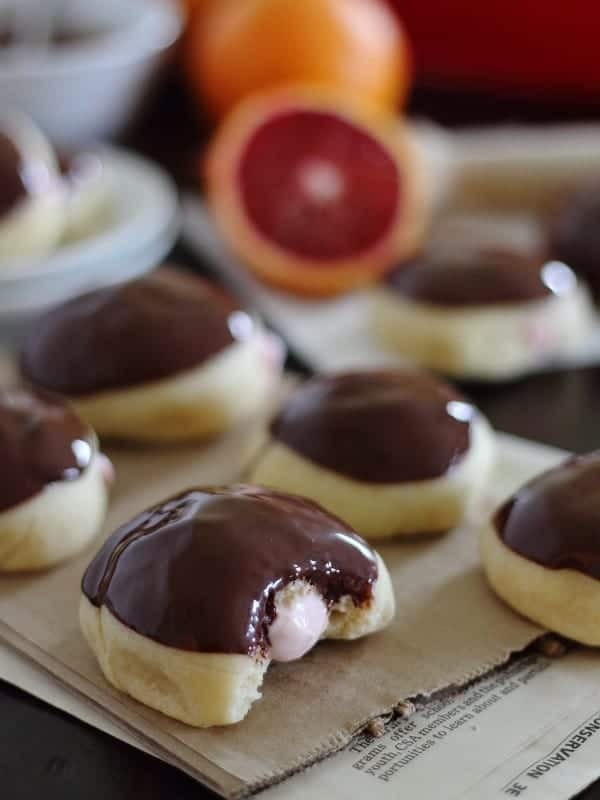 Plus chocolate, blood orange and cream cheese…hard not to be proud of that. 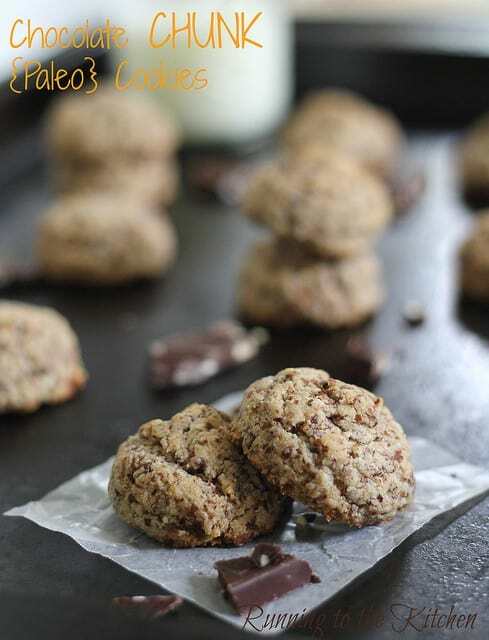 These chocolate chip paleo cookies are my most viewed recipe. It’s kind of funny because I’m not “paleo” but I do have a few paleo recipes on the blog because I tend to eat that way a good chunk of the time. I’m not really down with food/diet labels and yet the most popular recipe on my site is just that! I don’t know how “guilty” this is but I could live off of takeout Chinese food wonton soup and be very happy for the rest of my life. Thanks Gina! Hope you’re having a wonderful time in Europe! You can find more of Gina on Twitter, Facebook, Pinterest, Google+ and Instagram. adoree Gina and her blog :) its nice to get a glimpse of her life on your blog. yayyy! I always love these-and oh yeah….obviously….donuuuuts! Those doughnuts!! Seriously drooling. Not sure how I’ve never read Running to the Kitchen, but it’s such a beautiful blog and Gina’s daily schedule sounds pretty awesome to me!